View new or similar items here! 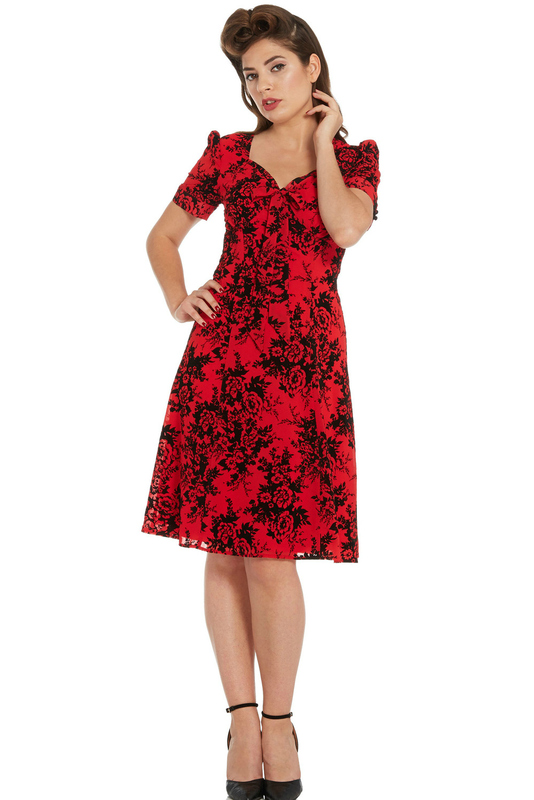 We present the seductive Voodoo Vixen Red Vintage 1950s Dress in UK Sizes 8-14. Boasting a pretty ruched sweetheart neckline, and stylish puffed cap sleeves which have small keyholes and fasten with decorative buttons. 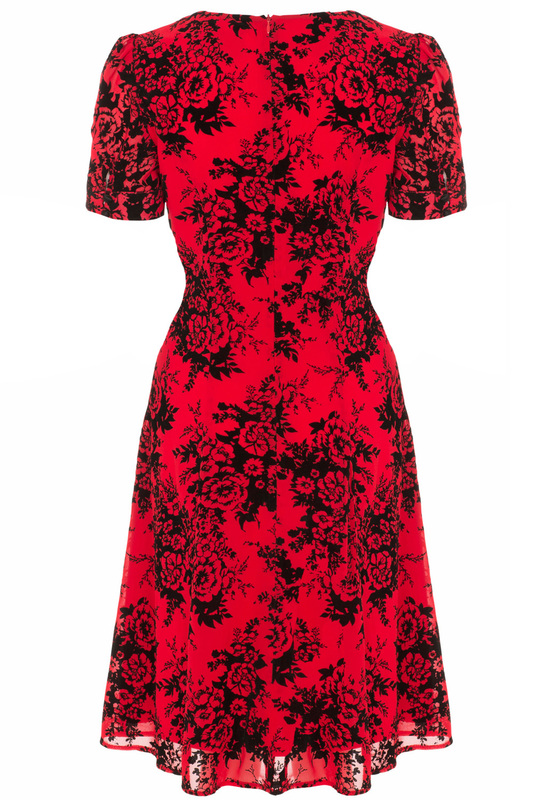 This Voodoo Vixen Red Vintage 1950s Dress is crafted from a flocked fabric, topped with a kitsch floral print which just oozes Christmas festivities and is perfect worn to upcoming events for Autumn / Winter 2015! The flared skirt is more than generous enough to accommodate a petticoat, should you wish to dramatise your look with a "New Look" 1950s silhouette. Although this dress does not come with a petticoat, please see our shop for a full range - this dress looks best with a 25 -27 inch petticoat. Simply slip into this amazing little red 50s dress, slip on some red heels, and let the seduction begin! The bodice boasts a sensational sweetheart shape neckline adorned with flowers and a beautiful bow drops to the front. The waistline is elasticated to provide comfort and it will most definitely flatter your figure to the full. This exquisite dress screams the 1950s era with the signature fitted bodice that nips in to the waist, whilst the skirt gently flows from the waistline to give you a fit and flare finish. 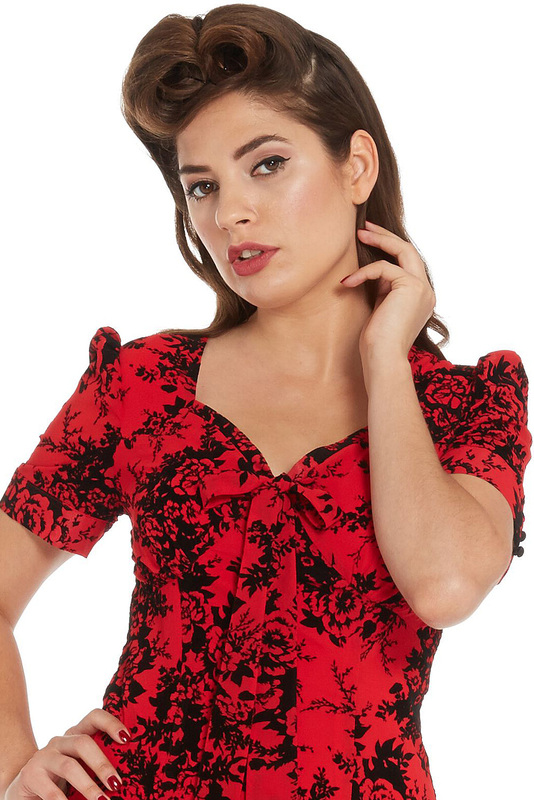 The gorgeous Voodoo Vixen Red Vintage 1950s Dress encapsulates the superb quality and edgy design, spirit of the rockabilly vintage fashion brand. Offering a striking cut, with a close fitted bodice with puffy cap sleeves, and a flared skirt that falls on the knee to a midi length style. The striking monochrome embroidered pattern and sweetheart neckline, compete as statement features of this must-have 1950s dress. The dress fastens to the reverse with a concealed zipper. A typically unique designer Voodoo Vixen Dress, this vintage 50's style dress promises you all the head-turning style and gloriously seductive distinction your heart could desire! A fitted bodice nips in at the waist creating an enviable hourglass figure thanks to voodoo vixen's authentic vintage style cut. To the back of the dress, it doesn't fail to impress as it boasts more sumptuous florals and it fastens with a concealed reverse zipper. If you're looking for a special dress with a vintage twist, then the voodoo vixen bernadette snowflake dress will transform you to a 1950s Hollywood Starlet! 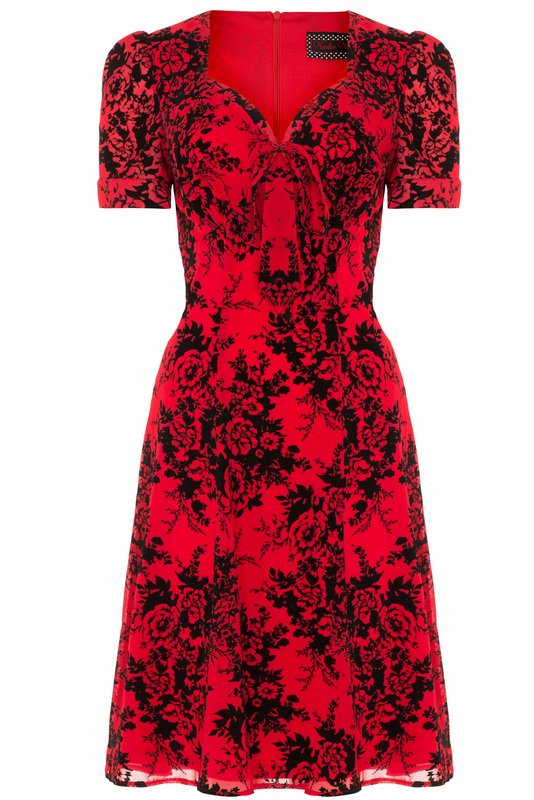 An up-to the minute cut along with the retro styling, makes this dress an impressive style. This dress will work wonders for most body shapes, and makes this a must have for your Autumn / Winter wardrobe. We're an authorised stockist and are proud to bring you Voodoo Vixen at PDUK. 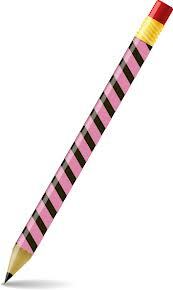 Please read our customers reviews on this item or be the first to comment. Don't miss out on your dream look at this dream price. Don't forget, we have a UK store in Dover, Kent where you're all welcome to try before you buy! Not sure which dress best suits your body shape? Click our helpful Shop By Body Type Page for help and advice or pop in to our store and try before you buy our fabulous dresses! If you already know what suits you then great, but for those of you who are unsure, we have a collection of lovingly handpicked dresses suited for each body type. Select from a range of exclusive dresses for every occasion covering Wedding Dresses, Proms, Parties and Cruise Dresses. These figure flattering dresses are certain to land you on the best dress list for those evenings that lie ahead. View our customers reviews and feedback on each of our dresses and see our large selection of Prom Dresses exclusively with us online at PDUK. You have the right to cancel an order within 14 days (in accordance with the Consumer Protection (Distance Selling) Regulations 2000 (DSRs)). PDUK refunds purchases for returns requested within 14 days from the day your parcel arrives. Any returns requested outside the 14 day period e.g. for faulty items, will be authorised by our Customer Services Team. Still undecided on which dress to buy?